Across the energy sector, women make up less than 30% of the workforce, but that's changing. What's it like to be a woman working in energy? What can both male and female executives do to encourage sector diversity? And what skills make any young professional well-prepared for an energy career? 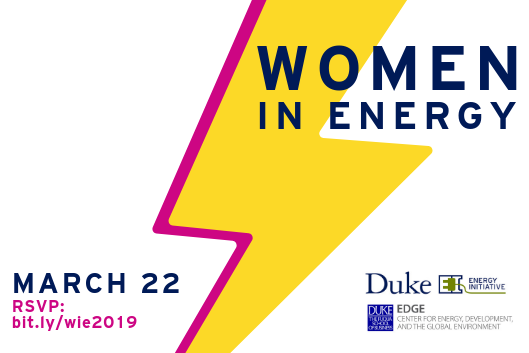 All are welcome at our Women in Energy panel discussion featuring four industry innovators on March 22 from 11:45 a.m.-12:45 p.m. in Ahmadieh Family Auditorium (Gross 107). Students can also sign up for breakout lunch sessions from 1-2 p.m. Learn more & RSVP: http://bit.ly/wie2019. Organized by the Duke University Energy Initiative and the EDGE Center at the Fuqua School of Business.